UPDATE: Read this SF Chronicle piece on the origins of the pipeline explosion, from the perspective of San Bruno residents. 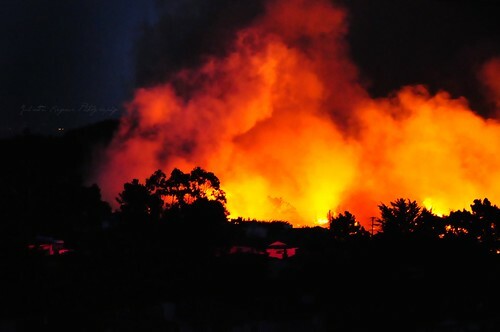 A San Bruno neighborhood was devastated by an uncontrollable fire last night when a PG&E pipeline exploded at 6:24 pm. The explosion, which left behind a 30-foot-wide crater, has so far killed 4 and injured more than 50 while destroying more than 30 homes. The damage has been so bad that Lt. Gov. Abel Maldonado (who is acting as Governor as Arnold Schwarzenegger is in Asia) has declared a state of emergency in San Bruno. Early investigation indicates that the pipeline explosion may have been the result of negligence on the part of PG&E. In fact, numerous San Bruno residents said that they complained about the smell of gas to the company in the weeks before the explosion. One resident, Tim Guiterrez, said that when he complained to the company directly, they told the community to shut their garage doors and stay inside while they investigated. “Right now, we haven’t got confirmation about that,” said PG&E President Chris Johns. “but we have records that we are going back right this minute to try to confirm what exactly those phone calls look like and when they occurred.” PG&E appears poised to take responsibility for the pipeline explosion if authorities decide they are at fault. “If it is ultimately determined that we were responsible for the cause of the incident, we will take accountability,” the company said in a statement Thursday night. This explosion appears similar to the Walnut Creek gas pipeline explosion that killed five workers and seriously injured others in 2004. In that case, GJEL helped the families of victims navigate the pain and trauma that followed the tragic accident. Our thoughts are with the families of the explosion’s victims, and the town of San Bruno. Check back for updates on this developing story.